Lest anyone think I am too hard on Hollywood celebrities for their role in today’s “bare legs culture,” (a phrase I coined in 2001 and still have never heard anyone else say), this month’s blog topic is about the handful of today’s celebs who do wear pantyhose (often, where you would least expect it). The first celeb who comes to mind is Olivia Munn, co-host of the “Attack of the Show” program on G4. I mean, c’mon, she’s young and this is a hip show. So why is she often seen wearing pantyhose? To me, the reason is that she has class. It’s so cool when a young professional “gets it” and chooses to wear pantyhose on air. Since I’m talking about G4, which carries the show, “Ninja Warrior,” I have to mention more about the topic of my favorite subject lately, Asian women, who are more likely to be seen wearing pantyhose. I’m still shocked that no one commented on last month’s post. I thought the whole world (not just me) was Asian crazy, but not even any of our Asian ActSensuous customers commented on that post. So, here I go again. Even during the “world’s most grueling obstacle course” that is Ninja Warrior, female contestants often wear pantyhose with their outfits or costumes. Are you getting this? Pantyhose during the world’s toughest obstacle course! Beautiful Japanese women samba dancers give a brief performance to the crowd at the starting line of a Ninja Warrior contest, just before one of the members competes. Many of the contestants show up in costume, complete with pantyhose. These female athletes and celebrities of Japan know they are likely to fall into the muddy waters beneath the course on Mt. Midoryama, yet, they have so much style and grace (and presumably because they’re appearing on national TV), they have the class to wear pantyhose. And I’m not stopping there. Even many of the female audience members in the bleachers can be spotted wearing skirts, high heels and pantyhose. How many American women would you find attending an athletic contest wearing that kind of attire? None! OK, moving on … here’s a movie trilogy where one would not expect to find the actresses wearing pantyhose. It’s the “Resident Evil” movies, in which star Milla Jovovich (“Mee-lah Yo-vo-vitch”) battles zombies during a post apocalyptic-style period of the world. Pantyhose while shooting up flesh-munching zombies? Yup. Milla Jovovich as Alice dispatches zombies during a scene in Resident Evil. 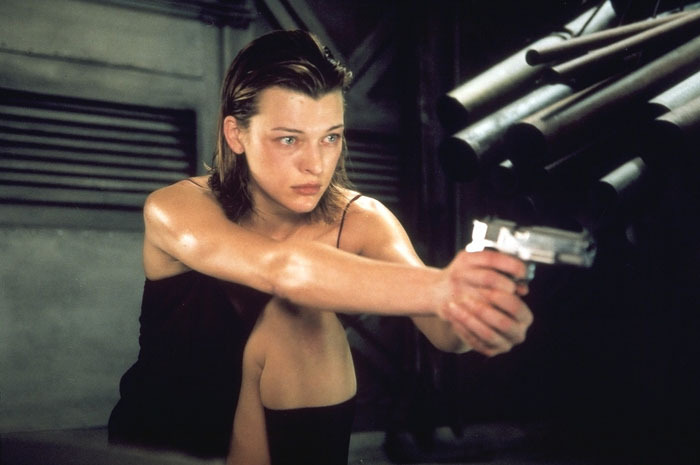 As zombie movies go, the trilogy might be the best ever, in large part because, while Milla is beautiful and feminine, she kicks the @#$%^&* out of some zombies. Jovovich also wore pantyhose throughout another movie called “.45” (as in a handgun), in which she stars as an abused girlfriend. This world renowned model, singer and talented actress is my new hero. Finally, I recently saw a young actress I never would have expected to be wearing pantyhose as a guest of a late-night talk show. I take that back: I always expect certain actresses to wear pantyhose with the awesome dresses and heels they do wear on these shows (even if for no other reason than that the sets are extremely cold). But even the classiest ones, such as Sandra Bullock and (gulp) my little Lucy Liu, have disappointed me so many times. So I was stunned to see Anne Hathaway appearing on David Letterman wearing a beautiful dress, heels and pantyhose. I have just become an Anne Hathaway fan. OK, now it’s your turn. What are your thoughts about this? Which celebrities do you find can always be counted on to wear pantyhose?